You know the type. The suburban home with Hardie board siding, a gabled garage, and HOA-friendly lawn decorations. 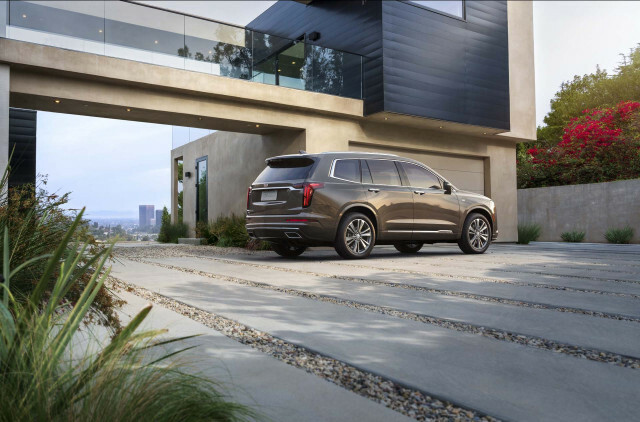 If it weren’t for the new 2020 Cadillac XT6 parked in the 2+1 garage, there’d likely be a Denali or Jeep Grand Cherokee parked next to the Escalade instead. Now, there are more options that include a crest. The new, three-row XT6 crossover from Cadillac that debuted Sunday ahead of the 2019 North American International Auto Show in Detroit may as well be the big Cadillac Escalade’s newest, and most expensive spend-up accessory and its frequent garage companion. Next to the freezer and golf clubs, naturally. The 2020 XT6 will go on sale in the spring, although Cadillac didn’t specify how much it would cost. Although the XT6 doesn’t tread any of the same ground as the flagship Escalade, its resemblance in the growing field of Cadillac crossovers is undeniable. The XT6 borrows styling elements from the small XT4 crossover and spreads them over a bigger frame borrowed from the Chevrolet Traverse and Buick Enclave. The XT6 is actually shorter than both, riding atop a wheelbase of 112.7 inches long, with 198.8 inches from bumper to bumper—roughly six inches shorter than both the Traverse and Enclave. The XT6 is sized closer to the GMC Acadia, although it’s incrementally longer than that crossover, and the XT6’s just 9.3 inches longer than the XT5. The XT6 adds thinner LED headlights and a deeply bowed front bumper underneath its grille. Tall daytime running lights frame the 77.3-inch wide track across the front; tall, standard 20-inch wheels (or optionally 21-inchers) fill out the wheel wells along the body sides. In back, the XT6 skips the Escalade’s tall taillights that run up to the roof, but the tall L-shaped lights run from the character line and rear fenders down toward the chromed dual exhaust ports in the rear bumper. 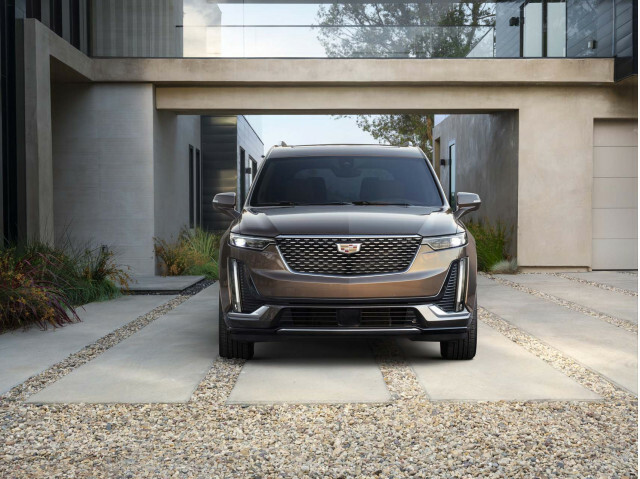 With the XT6, Cadillac fills out its growing portfolio of crossovers that’s expected to include battery electric crossovers within the next few years. Under the hood of the XT6 (for now) is GM’s familiar 3.6-liter V-6 that makes 310 horsepower and 271 pound-feet of torque mated to a 9-speed automatic transmission. Base versions of the XT6 are front-wheel drive, although all-wheel drive is available on base models and is standard on Sport versions. Cadillac didn’t detail hybrid or turbocharged powertrains, although both are possible for future variants. 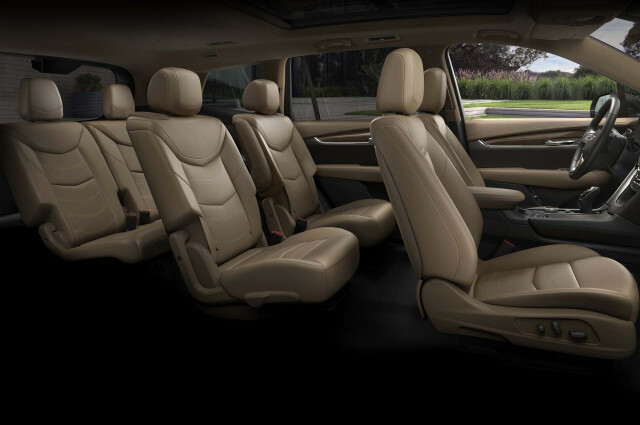 Like the Traverse and Enclave, the XT6 features three rows of seats for families. The XT6 will initially be offered in Premium Luxury and Sport trims, the latter getting adaptive dampers and a sport-tuned steering setup. The all-wheel-drive system is similar to what’s found in the XT4, a twin-clutch system that can fully disconnect the rear axle for better fuel economy. Inside, the XT6 will offer leather upholstery and real wood trim, while Sport variants swap out wood for carbon-fiber accents. An 8.0-inch touchscreen with Apple CarPlay and Android Auto compatibility will handle infotainment duties and Cadillac will include a rotary knob for redundant controls, borrowed from the XT4 crossover. A sunroof is standard. Softer leather, upgraded audio from Bose with 14-speakers, a power-folding third row, and heated and cooled front-row seats and heated second-row seats are on the options list. The XT6 will come with standard automatic emergency braking and active lane control, although a full-speed automatic emergency braking system, surround-view and night-vision camera systems, reverse automatic emergency braking, and a camera-based rearview mirror will be spend-up extras. Cadillac’s SuperCruise driver assistance system is absent from the initial specifications from the automaker, although Cadillac has committed to offer the semi-autonomous tech on all its vehicles sometime next year. Even though the XT6 and Escalade seemingly seat a similar number of people, it’s clear that Cadillac isn’t interested in offering a competitor to its flagship SUV—just something to park alongside it. For more coverage from the 2019 Detroit auto show, head over to our dedicated hub.